What I want to talk about here is how to train the dog who has never been lure trained. The basic rules of lure training are aimed at three goals: to teach the dog to chase the lure on straights; to teach the dog to run turns; to teach the dog to be so intent on the lure that he ignores another dog running with him. 2. Start the dog running alone. 3. Start with the dog running straights from 100-200 yards long. These are best found at lure practices or at Whippet straight (NPR) races or practices. A bonus is that the lure is usually a drag lure with fur and a squawker on it. 4. Let the dog watch other dogs running and don’t discourage him from barking (cheerleading) or pulling toward the lure. 5. Tell the lure operator that the dog is a first timer and you want a slow, jerky start. 6. When it is your turn, put the dog on a slip lead and run forward with the dog as the lure starts to move. Don’t release the dog until he is pulling toward the lure. 7. Ideally have someone who the dog knows slip the dog, while the owner is at the far end of the run to catch him. If the dog is shy you may need to slip him yourself but then jog out to pick him up at the end. 8. If the dog runs after the lure but does not go to the lure at the end, you run to the lure, shake it, call him over and praise him. If he does bite the lure at the end of the run, praise him and catch him there. 9. Two straight runs are enough for one day. 10. Run straights on at least two separate days of practice before introducing turns. 11. When you first attempt a course with turns pick one without a lot of very complicated turns and tell the lure operator that the dog has never run a turn so you want a lot of lead at the turn to give the dog a chance to turn. 12. Run a course with turns for at least two days of practice before running the new dog with a second, experienced and clean running dog. Last summer I received a premium list for Junior Courser tests at the Western Specialty. The course plan was simple and what the lure operator called “kind.” I wanted to run my youngsters, who had never seen a lure, for their JC titles so that meant we had to get to practices. It is really fun to watch new dogs discover the joy of chasing a lure. At the first practice my dogs started out barking at all the other dogs who were barking at the lure. My guys had their back to the lure to face the other dogs. As we waited for our turn Ringo started to keep his eye on the lure and bark and do push ups. Jirel just watched intently. Starfleet continued to bark at the other dogs. It was hours before they had a chance to run but they learn by watching. When their turn came, I told the lure operator they were first timers and asked for a slow, jerky start. I ran with them to start them. Ringo started right out and ran the 200 yards. Jirel did a really flashy extended trot alongside me as I ran after the lure. She could trot as fast as I could run. But finally she pulled ahead and started to run so I could release her. Starfleet for all his apparent lack of interest ran decently. None of them ran really hard. Beginning dogs typically run as if expecting the lure to stop and are so busy looking at it that they sort of bounce up and down. The next week we went to a lure trial that had announced a practice afterward. By this trial the trio had oriented towards the lure so they would at least point towards it when they barked. A friend who I had met lure coursing in 1975 came to help me this time. She would release and I would catch. There was a decent straightaway next to the lure machine but except for that the course was very complicated. I told her to be sure I only let them run the straight. (It is tempting to try to run dogs all the way around the course and we watched some beginners try to do that but their dogs were giving up in mid- course.) Betty Lou and I discussed the foolishness of starting dogs on a complete course. In the old days we never did that. We started dogs according to the rules listed above. While a lure operator may ask you to run your dog on turns before it is ready, resist the temptation and refuse. You don’t want to teach the dog to ever come away from the lure. The learning dog should always be able to catch the lure at the end of the straight. By the kids’ third lure experience at the Lompoc Junior Courser tests they could identify the sound of the lure machine when we pulled into the parking lot. And they were so stimulated when we got to field side that I had to tie them out separately. Many dogs will bite anything near them in frustrated prey drive when they can see a lure move but cannot reach it. So once they are intent on the lure it is not a good idea to have them within reach of another dog. And many dogs learn to chew through their leashes or slip them to get at the lure. Mine haven’t, so I could still tie them. Another solution to holding more than one dog at lure side is to muzzle them. Patti's FCh. Lucy. Lee P. Gearhart Uma Rapiti Photography http://www.umarapiti.com Home of the "Hound Retreiver"
In three lure practices they had gone from unconcerned to intense lure dogs. And since you never know whether a dog will chase lure until he actually does there is a lot of hope, uncertainty and relief on the part of the owner when the dog does chase. I was delighted when all three of the kids earned their Junior Courser titles at Lompoc. It has been a long time since I have gone through the hope and anxiety of starting new dogs on the lure. At this point the dog is ready to lure course. If you want to compete in oval track or straight racing you would then need to teach the dog to load into and break from a starting box but that would be taught after all the above. Each of us then acquired puppies that we wanted to grow up to be lure coursers. Her Image practiced a lot as a puppy, running singly in the puppy stakes. My two, Trip and Kitty Hawk, only practiced a couple of times as puppies. None of these dogs ever ran clean as adults. I retired Trip and Kitty Hawk at their first lure trial when they each coursed the other dogs instead of the lure. It took Betty Lou longer to give up on Image, and they tried every retraining method short of a shock collar but nothing could keep him from interfering with the other dogs and he went on to a career as a perpetual lure test dog running alone for the rest of his life. 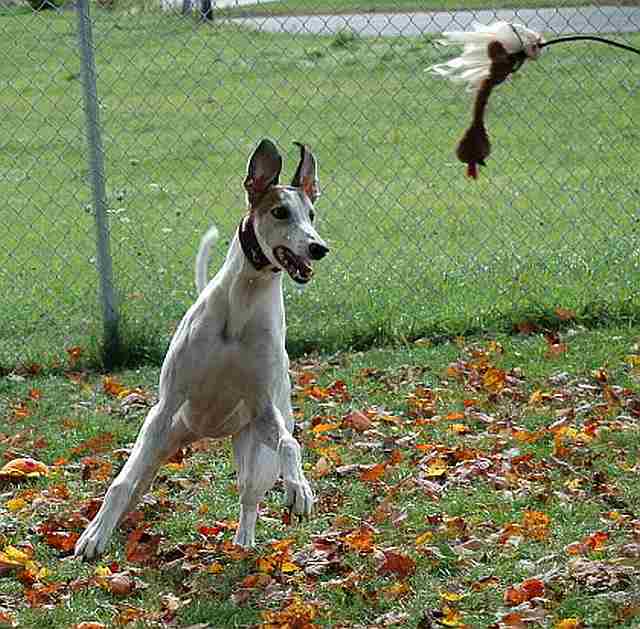 We had both learned rule number one the hard way: Never practice greyhounds less than 15 months old. In twenty years of following that rule we have never raised another interfering dog. And a P.S. for first timers: Take shade, a slip lead, a lot of water, a spray bottle, and a first aid kit to practices. Thanks for your input, Kathleen. Well said. I’d like to comment, if I may, on lure coursing a former track Greyhound. I agree that these former track Greyhounds have been trained to chase a lure, and are quite good at it. However, most novice Greyhound owners have not. That is, they have not been educated – and integrated that education – into the ins and outs and convolutions of a lure coursing trial. They need to be every bit as socialised to the people, protocol and pooches as their dogs do. 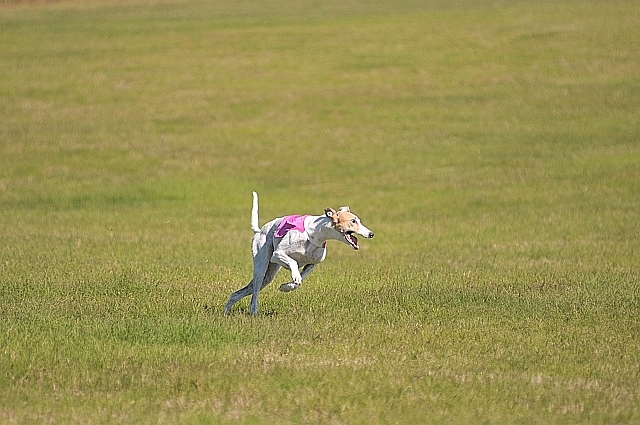 A practice run at a casual event can show if and how your dog will run. The tensions of the trial may be a different story, especially for a handler who is slightly nervous and confused. That lack of confidence can be transmitted to your dog, who will,too, become nervous and slightly confused. And who of us are/were prepared for the one or two handlers who try to tip you off-stride with the bits of nastiness they throw at you, so you handle your dog poorly, and they get the win and points? 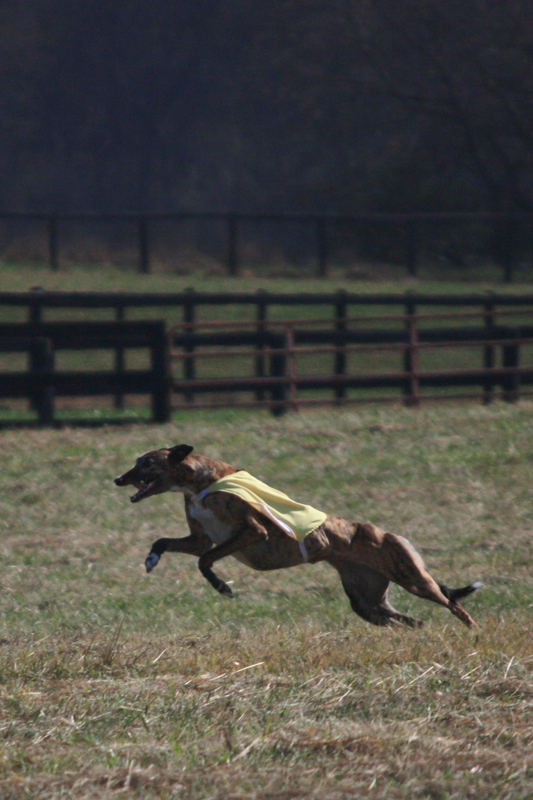 I had forgotten about that part of a coursing trail until I saw it in action at an ASFA event I recently spectated at. I have yet to see that in an article about coursing (or showing,etc. ), as it is a shameful fact that may put off people from getting into the sport. Yet it happens, and most are unprepeared for it. Forwarned may allow people to prepare a reaction for when it does happen. Ms. Burnham, I have always enjoyed your books and articles. I just stumbled across this blog today, and am happy to have found it. I don’t currently have any Greyhounds – just seven cranky old Whippets, but am thinking about shaking up their world with a Greyhound puppy. Thanks again!